So I haven't exactly be on hiatus over the weekend from my creative endeavors. Trust me, this armoire project is looming over my head and I just want to get 'er done. I had my niece and nephew over for the weekend in addition to my two kids (help!). And although I had all good intentions of making an arts & crafts hour (or two) to make Valentine's cards with them, that never quite happened. 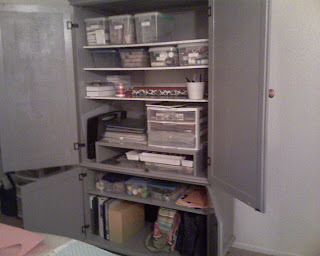 This is where having a nicely organized craft armoire where all my arts & crafts supplies are neatly organized into perfectly labeled containers <<insert girlie squeal here>> comes in. This weekend my precious tools were scattered around in my bedroom trying to hide behind my reading chair, under my bed and in every kinda concealed corner I could find. And then of course, there's the box that just couldn't be hidden, sitting right in front of my reading chair just waiting (for a year now) for a permanent home. No way, no now, could there be a successful, organized arts & crafts session with the kiddos. I really wanted them to take something away from their weekend with me and what better than their own homemade Valentine's cards. The kids went home Sunday morning. And after working out for 2 1/2 hours, cooking mom's amazing tostadas (click here for recipe) and hanging out at my girlfriend's for 3 hours in the afternoon, I came home to "relax". 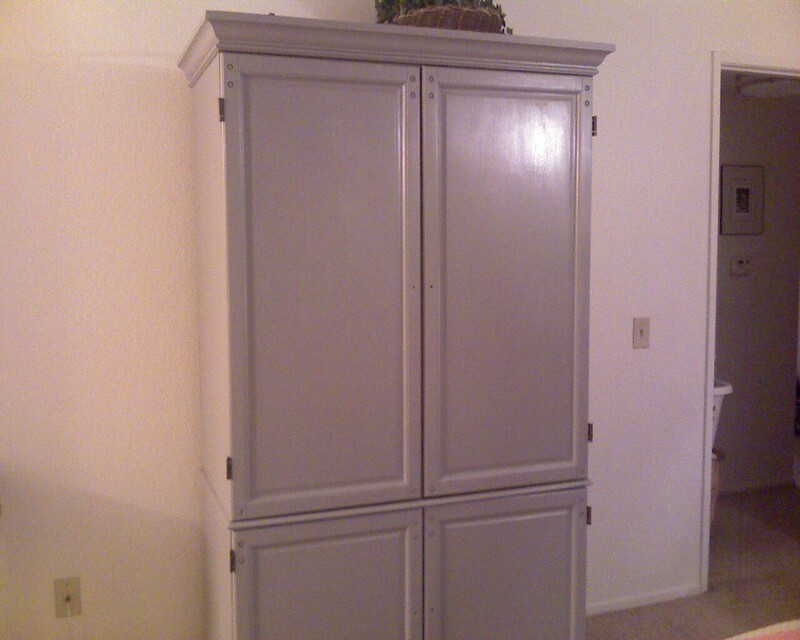 And then I walked into my bedroom, where the beast, I mean the armoire, awaited empty and lonely to be covered up from it's nakedness (missing doors) and filled in with all things nice and pretty (arts & crafts supplies). And there I went again. I added the hinges, doors, shelves and put in place the art supplies in the bedroom. Aahhh. What a relief. Take a look at 'er now. Speaking of 'er...what shall I name 'er? But, I'm not quite done yet. Still need to purchase new door knobs, extra plastic bins, and get all the supplies boxed up in the garage out to be sorted and stored into the armoire. I'm thinking vintage style glass drawer knobs like these to add a touch of whimsy. Or, I may just make a trip to Anthropologie to get a few of these cutie knobs, What do you think? Then and only then, will this project be completely done. You can view the BEFORE picture and the painting process here.